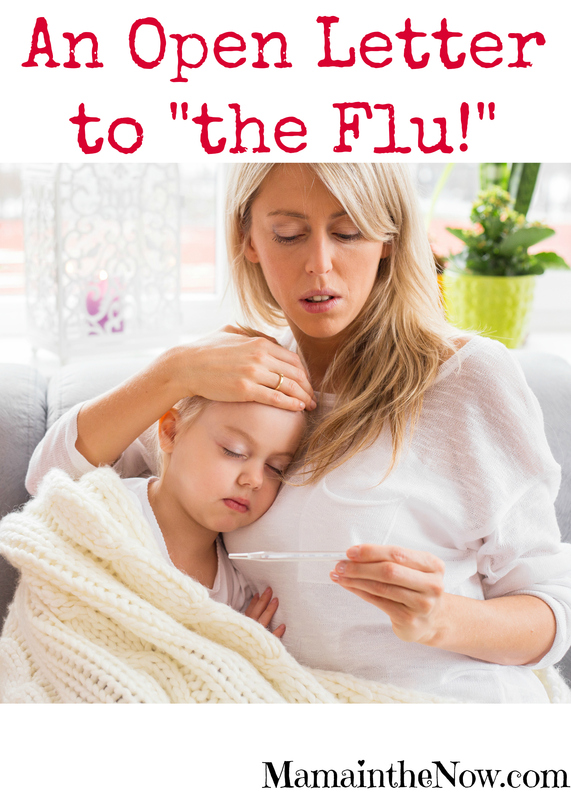 An Open Letter to "the Flu!" Dear Influenza A, B and whatever other alphabet-soup-combinations there are! I have feared you for years! – actually loathed your mere existence. Every single year you keep scientists on their toes. Your constant morphing and mutating leaves the vaccines full of loop holes and sometimes downright useless, as it is the case right now. Our entire family still vaccinates though – in hopes that we are somewhat protected from your evil ways. Right now we are in the thick of an influenza outbreak in our home, and let me tell you – I no longer fear you. We are living one of my worst nightmares, and we are OK. Granted there are fevers, chills, coughs and some bad visits to the bathroom, but for being in the middle of one of my biggest fears this COULD be worse! I know that each year many old, young and defenseless people fall victim to your quickly spreading epidemics. My heart breaks for anyone affected by complications due to the flu. I know you are not something to take lightly or completely ignore. But for today, for right now – I just wanted to let you know that I am staring you right in the eyes and I am NOT blinking or backing down. You knocked one of my precious boys off his feet for several days. It was even the one who we try to protect the most. But after a few days of watching an endless stream of Cartoon Network, he is slowly on the mend. I AM waiting for the other shoe to drop though – but I pray that all the others are strong enough to fight you. But for tonight, for this flu season – I want to let you know that even with a visit by Influenza A in November and now one by Influenza B, our warrior is OK – he is holding his own. So please admit defeat, stop infecting our loved ones and just quit changing in an effort to render the vaccines useless. Influenza, the only thing you accomplished this year was to prove to me that our boy is stronger than ever before. He may have been knocked down, but he did not get knocked out – and there is a big difference! You also showed me that even my biggest fears are no match for a calm mama, a good pediatrician and a solid family union. Flu (I think we are on a nickname basis at this point), you were never welcome here, in fact we did everything to keep you away. We will continue to vaccinate and do whatever we have to do to prevent another visit by you – but please know that I no longer fear you! I now know the strength that lives within our four walls! Hey there Mama, sounds like there’s been a lot of exhaustive days at your house and I hope you have patted yourself on the back. Sounds like you’re a terrific mother and your post, though it is a very serious issue, you wrote it in a clever, light-hearted yet determined way. I really enjoyed it! I am glad you’ve learned that your “weakest” son is stronger than he appears. I am sure in years to come he’ll be grateful that you know he is strong too. Now, on another front, that prepared twitter link in the middle of your article… that is so, so very clever. I want to be able to do that. Do you think you can write a tutorial or send me a link or I don’t know, email me. How do I get that onto my page? It is awesome… and yes, I retweeted… couldn’t help myself. Put the button before me, I had to push it! All the best for a speedy recovery this year and hopes and prayers your household will be spared nexgt year! Memee. (ps found you via sharefest) Yay, you’ve got a new follower! Thank you for checking me out! The kids are on the mend tonight – therefore so is my sanity! I will email you about the plugin I use for Twitter! When the little ones get sick you just feel so sorry for them. The flu in springtime?? Not fair!